When it comes to Mexican food, most people in American probably think of Taco Bell. Oh, how a mighty cuisine has fallen! Nothing could be farther from real Mexican food than ground beef, crispy, bland taco shells, and shredded orange cheese. However, even some of those who reject the brown bag, crunchy tacos of the Green Burrito, Taco Bell, or Del Taco also wander along aimlessly in their search for true Mexican food while snacking on a lesser evil: Tex-Mex. enough to have my first true Tex-Mex experience. A couple of friends and I got tacos from Torchy’s Tacos in Dallas. Upon receiving our orders and digging in, one of my friends (who happened to be from Dallas) remarked that it was good that we had decided to get “real” Mexican food while in Dallas, instead of some fake stuff. I’ll admit it, the tacos were excellent, but hardly emblematic of the simplicity and freshness of Mexican food from southern California or (gasp) Mexico. In Dallas the taco shells arrive thick and slightly crisped. The salsas, instead of being organized by spicy level, are seemingly organized by the amount of sour cream. Even the “hottest” salsa—“use it sparingly” my friend had instructed—was hardly spicy at all! Even so, they were delicious. My first taco was the “Democract,” shredded beef with avocado, queso fresco, cilantro, onions, and lime. Although clearly fresh, the vegetables missed that snap and vibrancy that the mound of cilantro and baby white onion usually imparts on a taco from any truck around Santa Ana, CA. My second taco was fried avocado with refried beans, lettuce, shredded cheese, and a semi-crispy tortilla. The fried bit reminded me more of a day old falafel than a fresh cut of avocado lightly battered and fried. With all the beans and cheese and other veggies I could barely taste the presumptive freshness of the avocado, making it a matter of texture rather than taste. Although both tacos were good, they were clearly engineered to be more filling than fresh. 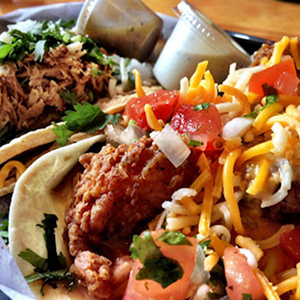 The moral of the story for Dallas and Tex-Mex in general: lay off the sides and additions. 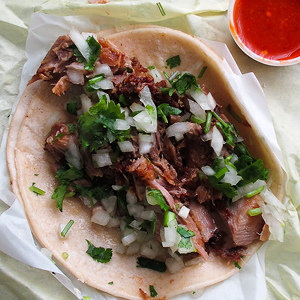 Tacos are supposed to be simple, highlighting the meat and the freshly made tortillas. When loaded up with other ingredients they might become tasty but they also drift very far from being a street food that is made quickly and gobbled down even faster.